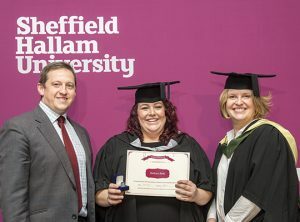 Graysons is delighted to have sponsored two awards for the Department of Nursing and Midwifery at Sheffield Hallam University (SHU) this year. The first award – the Graysons’ prize for recognition of demonstrating resilience during the specialist practice district nursing course – was awarded to the district nursing specialist practice student who demonstrated motivation, determination and integrity to overcome challenging circumstances and achieve success in completing the course. The winner of this prize was Martina Smith. Martina has been a nurse for 11 years and works for the Skegness and Coastal Community nursing team. She had to deal with, and overcome, the death of her sister from sepsis during the course – and was still able to complete it. Sepsis is a serious complication of an infection which can be life-threatening and Martina is doing all she can to raise awareness of it. 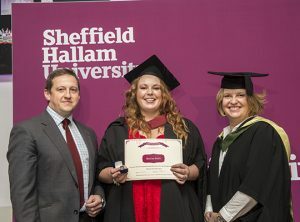 Kathryn Bebb won the Graysons’ prize for innovation in district nursing specialist practice, which was awarded to the specialist practice district nursing student who planned an innovative service and quality improvement that supports the implementation of service developments to improve patient care. Kathryn, who is a district nursing sister in Doncaster, developed a morale-boosting app that can be used by NHS staff to provide positive feedback on other staff. The app is now being developed for use on Twitter and Facebook. Chris Rodgers, head of business development at Graysons, presented the awards to the two winners along with Susan Wakefield, deputy head of the Department of Nursing and Dr. Rebecca Khanna, the assistant dean, academic development of SHU’s Faculty of Health and Wellbeing. Very many congratulations to Martina and Kathryn. We wish you the best of luck in your future career.